This press announcement includes "forward-looking statements" within the meaning of the safe harbor provisions of the United States Private Securities Litigation Reform Act of 1995. These statements are based upon the current beliefs and expectations of company’s management and are subject to significant risks and uncertainties. Forward-looking statements can be identified by such terminology as "believes," "expects," "potential," "plans," "suggests," "may," "should," "could," "intends," or similar expressions. Such forward-looking statements involve known and unknown risks, uncertainties and other factors that may cause the actual results to be materially different from any future results, performance or achievements expressed or implied by such statements. In particular, management's expectations could be affected by, among other things, uncertainties relating to our success in completing acquisitions, financing our operations, entering into strategic partnerships, competitive factors, and other matters. Forward-looking statements speak only as to the date they are made. The Company does not undertake to update forward-looking statements to reflect circumstances or events that occur after the date the forward-looking statements are made. ANN ARBOR- Tommy Chong, half of the famous marijuana-themed comedy duo Cheech and Chong, has been announced as the headline speaker at this year’s Hash Bash celebration April 4 in Ann Arbor, Michigan. Hash Bash is the largest protest advocating marijuana law reform in Michigan. The Bash, and its companion celebration, the Monroe Street Fair, drew an estimated 8,000 people last year. “We are so proud to have Tommy Chong attending the Hash Bash and Monroe Street Fairs this year,” said longtime Fair coordinator Charlie Strachbein, who is a principal in the BDT Smokeshop chain, the primary sponsor of Chong’s appearance in Michigan. Other notables appearing in a speaking role during Hash Bash include cultivation guru DJ Short and former Hash Bash frontman Adam Brook; nationally known Michigan advocates Rick Thompson, Jamie Lowell, and Chuck Ream; elected officials including Representative Jeff Irwin, Mayor Virg Bernero of Lansing, Ann Arbor councilperson Sabra Briere; scientist Dr. Dave Peters; lawman Sheriff Bill Federspiel of Saginaw County; attorneys Michael Komorn and Matthew Abel; patient and SSDP representatives. Appearing on stage and addressing the crowd this year: the man who was the inspiration for the gathering that has evolved into the Hash Bash, John Sinclair himself. “We offer a great format for local leaders and national names to speak directly to the public and address issues that are important to them,” said Hash Bash’s Director of Operations, Nick Zettell. The 44th Annual Hash Bash will be celebrated on the campus of the University of Michigan, which prohibits marijuana possession and use. The Monroe Street Fair, just two blocks south of the Bash location, is in the city of Ann Arbor and cannabis is consumed openly and in volume. Ann Arbor businesses boom every year during Hash Bash, and this year the economic benefit to the community will be doubled as the entire weekend is filled with cannabis-themed events. In addition to the Hash Bash and MSF, Leni Sinclair will be displaying her photography, and there will be a Peace Table discussion featuring Michigan’s divergent pro-cannabis organizations, on Friday during the Michigan NORML Quarterly Meeting; Students for Sensible Drug Policy’s Midwest Regional Conference is Sunday. Chong may be famous for being the better-looking half of Cheech and Chong, a twosome from California that became legendary comedians, motion picture stars and recording artists, but he’s received notoriety recently for a stint in federal prison and healing his prostate cancer with marijuana medicine. With media cameras rolling, Chong announced his illness in 2011, He vowed to beat the cancer with cannabis-based medicine and in 2013 declared that he had done it. That was after Tommy Chong served a nine month federal prison sentence in 2003-2004 for Internet sales of bongs and smoking accessories. On October 24th, the Cheech and Chong Up in Smoke tour is coming to The Paramount in Huntington, New York. Pre-sale begins tomorrow at 10am New York via the link above. Tommy Chong lit up with Cypress Hill's B Real in his show The Smokebox. Tommy looks sleepy. For the first time since 2009, Cheech and Chong are returning to Australia. The five date tour kicks off June 18th in Brisbane. Tickets go on sale March 24th at 4:20PM local time. 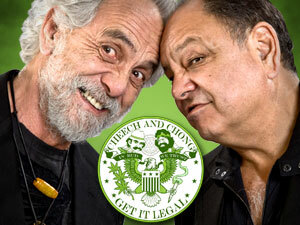 On April 11th, the Cheech and Chong Up in Smoke tour featuring WAR is coming to Prussia, Pennsylvania. Tickets go on sale tomorrow at 10am local time via the ticket link above.